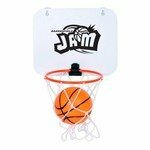 Our custom Mini Basketball Hoops will surely be a slam dunk at your next tradeshow or marketing event! From blank mini basketball backboard, suction cup mini basketballs backboard and so much more! Fully custom and designed exactly for you! All of our Mini Basketball Hoops products can be personalized with your company logo or a design of your choice.